Elementary & Intermediate Algebra, 4/e by Baratto/Bergman is part of the latest offerings in the successful Streeter-Hutchison Series in Mathematics. The fourth edition continues the hallmark approach of encouraging the learning of mathematics by focusing its coverage on mastering math through practice. 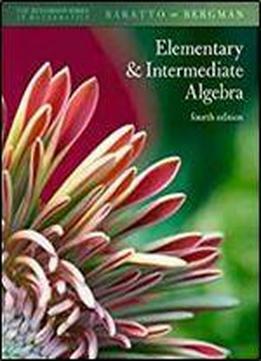 This worktext seeks to provide carefully detailed explanations and accessible pedagogy to introduce beginning and intermediate algebra concepts and put the content in context. The authors use a three-pronged approach (I. Communication, II. Pattern Recognition, and III. Problem Solving) to present the material and stimulate critical thinking skills. Items such as Math Anxiety boxes, Check Yourself exercises, and Activities represent this approach and the underlying philosophy of mastering math through practice. The exercise sets have been expanded, organized, and clearly labeled. Vocational and professional-technical exercises have been added throughout. Repeated exposure to this consistent structure should help advance the student’s skills in relating to mathematics. The book is designed for a combined beginning and intermediate algebra course, or it can be used across two courses, and is appropriate for lecture, learning center, laboratory, or self-paced courses. It is accompanied by numerous useful supplements, including McGraw-Hill’s online homework management system, MathZone.